Mon. 11/4 - SC Village Board Conference, Village Hall, 8 pm Thurs. 11/7 - College Financial Aid Planning Presentation, SC Library, 7pm; Thurs. NS BOE Meeting, HS Library, 7:30 pm. Sat. 11/9 - Catching Fire Event, Gold Coast Library, Glen Head, 3- 4 pm. 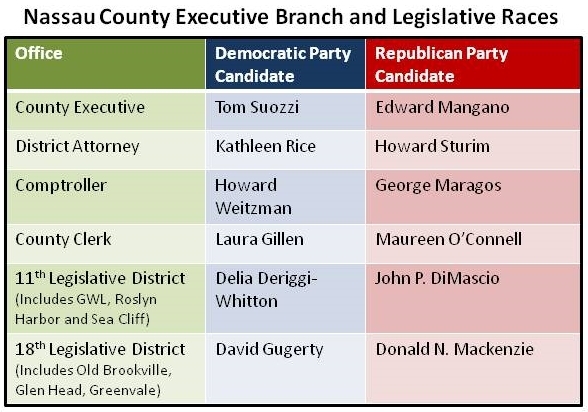 Several Nassau County and Towns of Oyster Bay and North Hempstead offices are up for grabs this Election Day including County Executive, representatives for the 11th and 18th county legislative districts, TOB Supervisor, TNH Supervisor, and County judgeships. In addition, six proposed changes to the New York State Constitution will be on the ballot including one allowing for the operation of seven Casinos in New York, and another that increases the allowable age for state court judges. Click here or on the charts for candidate information and the six ballot proposals. On November 11, we will again pay tribute, as we do each year, to the men and women of our great country who serve in the armed forces. We will recognize the sacrifices they make each and every day in wars and conflicts throughout the world; in remote areas of foreign lands, to ensure and protect our freedom in the United States. We will acknowledge the daily hardship their families endure while they are thousands of miles away, missing concerts and soccer games, birthdays and bedtime stories. The evening commences at 5:30 p.m. in front of Musu on the corner of Sea Cliff Avenue and Central Avenue, with an acoustic performance by the Lazy Dogs. The acoustic jam continues on the Village Green (across the street from Musu) from 6:30 to 8:30 p.m., with performances by Andy Aledort, Chris Kinnear, and friends, followed by RiDE with special musical guests (weather permitting). The pubs and restaurants of Sea Cliff will have "Chill Out" menu specials and will feature musical entertainment starting at 8:30 pm. The shops open late and host special "Chill Out" Happenings. Should be a great night out on the town... Join us and spread the word! Thurs. 11/7 - Presentation: College Financial Aid Planning, Sea Cliff Library, 7 pm.